On Sunday, our Church Board officially approved to begin using the Third Floor of the LA Tart Education Building for non-profits and small ministry-mission based organizations and businesses that serve the community. Our first official “tenant” is Pretzel Logistics Yoga, owned and operated by Grace Church. Grace will offer yoga classes throughout the week to folks all across our community. I firmly believe that our relationship with people like Grace and organizations like Pretzel Logistics is vital to ministry in this day and age. Yoga classes on the campus of Hood Memorial Christian Church shows that we care about people’s health and wellness, that we are finding creative ways to serve our community through partnerships, and that we believe church is about reaching out to our larger community. This is truly an amazing step we are taking as a church family! I asked Grace to write an introduction letter to our church family explaining a bit about what she does and why she does it. I encourage you to participate in one of her yoga classes at some point as yoga can be a deeply spiritual, meditative and prayerful practice that helps pull together our spirituality in mind, soul and body. So, church family…meet Grace Church and Pretzel Logistics! It is my pleasure and my privilege to introduce myself, Grace F. Church, and my company, Pretzel Logistics Yoga LLC to you and your families! 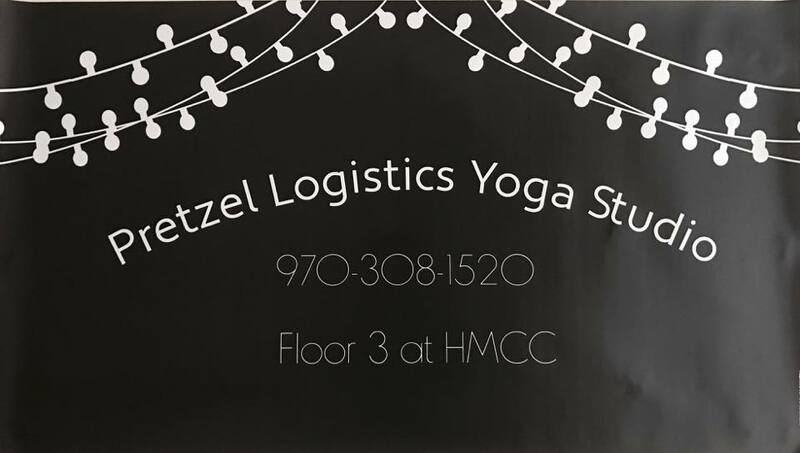 Pretzel Logistics has been teaching yoga throughout the Dunn, Benson, Lillington, and Fayetteville area for 3 years and counting! We try to empower the community through teaching natural tools to relax with breathing and essential oils, exercise through interactive classes and encourage people to make healthy life choices both emotionally and physically! We currently offer different class times, but would be honored to offer you all a chance to have your very own HMCC class every other Tuesday at 2pm beginning in March! This class will be a beginners yoga class and aimed for 55 and up! I invite you to come stretch and exercise with me in both chair yoga and standing exercise. The class is a gift to the members of the church and is solely based on donations as our special Thank You to you for welcoming us into your church home! Yoga has excellent benefits for the body, mind, and spirit! Yoga calms and balances the nervous system, brings down blood pressure and heart rate and provides strengthening of muscles and increased flexibility. Its also helps us to be stronger and less sick on a regular basis! Additionally, yoga can help us to relax, to learn how to reduce anxiety, depression and other mental-emotional factors. Yoga is especially important for people who are 55+, as our joints and bodies start to hurt and become less flexible. Yoga can relieve pain in a natural way through toning muscles to support our bodies and to maintain or develop flexibility for our bodies to be more resilient to daily life. Mentally yoga can keep you sharp and learning new things- opening new neuropathways in the brain- which sharpens memory! My husband and I live in Erwin! Originally from Colorado, we bought our home two years ago and just love it here! My husband is in the Army and plans to retire within the next 7 years, making Erwin our forever home! We have two cats, two dogs, and lots of love for our community! I have been studying yoga for 6 years and have had my business, Pretzel Logistics Yoga LLC for 3! We feel blessed and honored to be part of such a growing and potentially vibrant little town!